I sighed. You know the one. The "OMG, we've been here forever, I'm ready to go home now" sigh. I glanced around the children's play area at our local mall and saw him playing with another little boy, running around and giggling. I mentally tapped my foot, trying to balance my impatience and boredom with the knowledge that he was having fun and I should let him play longer. I carried his fussy little brother in my arms and waited. I chatted with my husband and we chuckled at our oldest son and his shenanigans. My eyes drifted away for a moment, engrossed in people-watching. Finally, I turned to my husband and gave him "the look". He nodded and we began to grab our things and mentally prepare for the potential meltdown of telling our son it was time to go home. I went to get the stroller from the entrance to the play area and the hubs went to get our son's shoes. I turned and scanned the play area and didn't see him. I wasn't worried at first because there are plenty of places for a little guy to climb into and hide behind. I kept looking, though, and still didn't see him. My heart began to pound. My breath caught in my throat. "Honey, where is he? I don't see him anywhere." My husband looked up from the shoe cubbies and began to walk all over the play area, calling our son's name. He was calm, but after a minute I could see in his eyes that he was worried, too. I began to panic and started shouting his name. I ran into nearby stores and looked for him. My husband flagged down a security officer and gave a description of our son and what he was wearing. I couldn't see, my eyes were blurry from tears. I wondered if today was the last day I'd ever see him. The last time I'd ever hug him or kiss him or see his sweet face. The emptiness and fear I felt inside was beyond anything I'd ever experienced as a mother. I wondered if someone took him. Or if he somehow wandered outside, and what if he got hit by a car. "Where is he? Where is my baby?!" I started to sob and my husband reminded me to stay calm, that we would find him, that he was OK. We walked a little further away from the play area to scope out some other stores. Then, I caught just a glimpse of a little boy with dark brown hair, grinning and climbing into this little train ride for kids and chatting with the train operator. The poor train operator was looking around worriedly, likely wondering where this little boy's parents were. I yelled to my husband and we both started running. We scooped him up in a flurry of kisses and hugs and scoldings to never run off like that again. 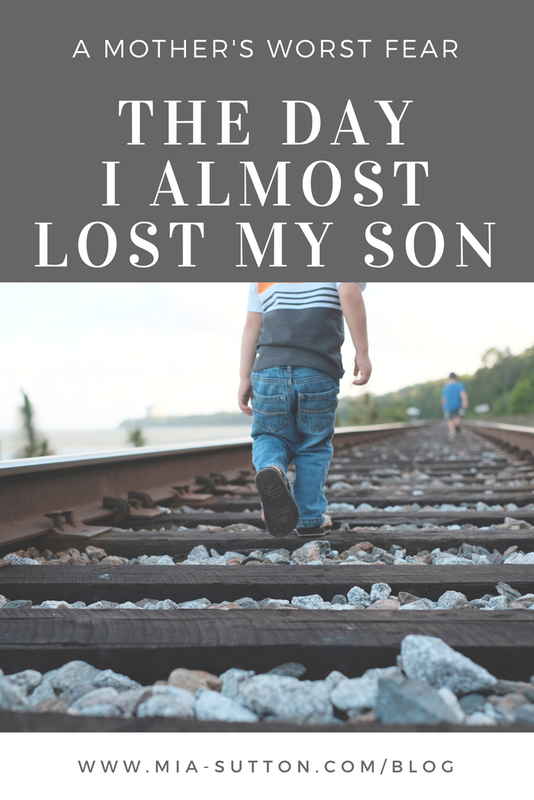 And that was the day I almost lost my son. This post was inspired by the monthly theme from H&L Writes, a haven for writers who want inspiration, encouragement, and support.